Whilst the Tour De France has been taking place over the last couple of weeks I have mostly been following it online - whether it has been good news or bad - and so this week I have been reviewing a variety of the sites I have visted to assess the quality, depth and usability of their coverage. So far I've looked at the offical LeTour.fr site, France 24 and BBC Sport. 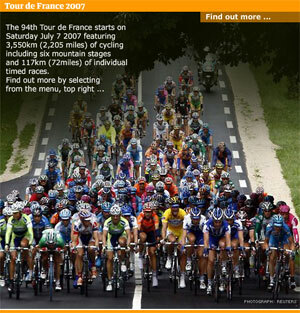 I have also been following the 2007 Tour on The Guardian's website. The Guardian's coverage of the Tour De France was boosted this year because of Le Grand Départ taking place in London. In fact, The Guardian gave away a free guide booklet with the print edition of the paper before the start of the race. The Tour De France has its own Guardian homepage, and has made it into the banner navigation on the Guardian Unlimited Sport site. The Guardian has also produced an entertaining and informative Flash guide to this years tour. As well as the standard content about the individual stages, there is an extensive section explaining the tactics of the tour. The daily coverage centres around the live text updates, which are hosted by bigoted anti-English know-nothing loudmouth lovable Irish rogue Barry Glendenning, sometime Fiver writer, and regular volatile guest on The Guardian's Football podcast. The coverage can be very entertaining, and features a lot of interaction from user via email, even if Barry does rather wear his lack of specialist cycling knowledge on his sleeve. The Guardian doesn't have a specific RSS feed for cycling or for the Tour De France. Aside from the live text updates, and before the Alexandre Vinokourov scandal erupted, the newspaper has usually been posting one or two news stories about Le Tour each day. The coverage from The Guardian hasn't been ground-breaking, but the Flash Tour guide was really useful in explaining the tactics of the peloton to a cycling novice like myself, and Barry Glendenning's minute-by-minute commentary has outshone the BBC effort for humour, if not the official site for accuracy. Tomorrow I'll be looking at the online coverage provided by Eurosport's recent sporting partnership with Yahoo!